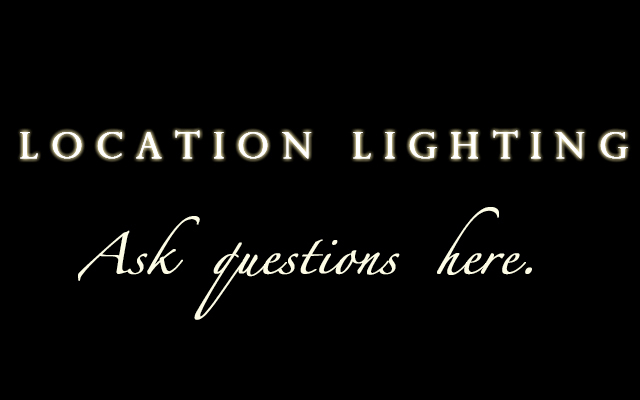 Last week I solicited questions regarding Location Lighting. Here are some of the questions I received and my responses. I am a photographer and have run across this term 1/4 CTO gell or full CTO gell. I have a gel pack that I ordered from the US but the actual gels do not have labels as to 1/4 or full. First - does this refer to the density of the gel colour on the gel film? Second - how can you tell which is which? I have just discovered your website and I think the images are really great." Thanks Allan. CTO stands for Color Temperature Orange. There are varying degrees of CTO gels ranging from 1/8, 1/4, 1/2, 3/4, and Full CTO. CTO gels are used to change the color temperature of the flash to warm. The stronger the CTO, the warmer the light output will be. Without the labels on the CTO, it is difficult to distinguish what strength CTO gel it is, however it is safe to say that the more orange the CTO is, the stronger it will be to change the color temperature. "Hi Will, I will be doing some shoots on the beach at sunset within the next month & would like to know what kind of equipment/flash accessories i will need? I use a canon 40d & still don't have an external flash! What is the best quality one? Great question Sharon. The first thing is to get the flash off of the camera. If you buy an external flash also known as a speedlight and place it on the hotshoe of your camera, you'll just have an extra powerful popup flash. The key to good lighting is to seperate the light from the camera axis. Depending on your budget, Canon has several options to choose from with their flagship speedlight being the 580EXII. It's their most powerful flash and it can act as a master, controlling other flashes. If you decide to get just one speedlite, you may want to consider getting some kind of triggering system that will activate the flash when it's off of your camera. There are several to choose from ranging from around $50-$150. If you're going to be using the flash outdoors, I would recommend using radio triggers. Radio triggers do not rely on "line of sight" and their signal is not effected by harsh sunlight. One other thing to consider is getting something that will soften or diffuse the light coming from the flash. The cheapest and easiest modifier to use is probably an umbrella. It will soften the light and spread it all around making a light that's a few inches big to 40 inches big. Will, Thanks for giving us the opportunity to ask questions. Off camera flash is something I have been struggling with and would love to try and understand better. Is there any sort of formula to know sync speed or what power settings to use on the flash (1/2 power or full) in certain situations. I mainly do portraits, and interiors. The Max Synch Speed of the D80 is 1/200 but that doesn't mean you have to use that shutter speed everytime. Nikon actually has a really good flash system called CLS. It uses TTL technology to determine flash output. TTL stands for Through The Lens. It sends a quick preflash and in miliseconds determines how much actual flash is needed to properly expose the subject. It works good in most cases but never great in all cases. I prefer using manual settings on the camera and the flash because once I get my exposure right, I know I can rely on consistent results for every shot. The real question is how do I determine the right exposure for a shot. I don't normally use a light meter. For outdoor shots or shots that have some ambient light, you'll have to worry about 2 exposures; ambient and flash. I start by determining what I want my aperture to be. I then choose my shutter speed and ISO. Shutter speed has virtually no effect on flash exposure however it does effect how much ambient light gets into your shot. Determine the balance you want to find between the subject and the background. I start with the flash off. I get my the exposure I want for the background by choosing the aperture, shutter speed, and ISO in manual mode. Once that has been determined and set, I introduce flash. Again, I don't use a light meter so I take a best guess, take a shot with flash, look at my lcd and make changes as needed. When shooting in a studio, I just keep my shutter speed at 1/160. I only have to worry about one exposure and that's the flash exposure on the subject. Choose the desired aperture, keep your ISO set to the lowest possible, and the shutter speed at max synch or slightly lower. I take a shot and look at the image and adjust my flash power as needed. Again, I don't use a light meter or try to figure out ratios. If I use more than one light sources, and often I do, I start with one light, get that right and then add more lights. This question was emailed to me from Bob. "Will: I have three speedlights (580EXII, 550EX, and 430EX). My light modifiers consist of a Gary Fong universal lightsphere and stofen diffusers. I am interested in what addtional equipment you suggest and how you use it." Bob, the Gary Fong and Stofen dome diffusers were designed primary for on camera flash as a way to diffuse the light and/or bounce the light off of a wall or ceiling. Since you have the 580EXII which can act as a Master and can control other flashes wirelessly, I would start using off camera flash. I would reccomend getting from light stands and some shoot through umbrellas. A shoot through umbrella can make a small speedlight into a huge light source. Remember that the larger the light, the softer the light. "Which lights do you prefer to use on location (outside), your Alien Bees or your Canon Speedlights and why?" Michael, I prefer using my Speedlights while on location because I don't have to worry about carrying a heavy battery pack and since I do a lot of beach shoots, I don't have to worry about getting fried if water touches my gear. "I have two questions regarding umbrellas on location. First: How large? Wind can often be an issue in outdoor shooting and a the larger the umbrella, the more it wants to become a sail. Second: If you use a shoot through umbrella, you can get closer to your subject (assuming a portrait) because you can place your flash, umbrella shaft, light stand, etc. away from your subject making it possible to get away with a smaller umbrella - BUT - and here's my question, what is the most obvious difference in the quality of light between a shoot through vs a bounce umbrella?" You're right. Umbrellas can act as a sail and just a little gust of wind can knock your gear over. This is why I try to work with an assistant as much as possible to hold the light. If I don't have an assistant, I use sand bags and weights to anchor my light stands. I prefer using a shoot through umbrella when photographing individuals because as you mentioned, I can place the umbrella really close to the subject. I often place a shoot through umbrella right outside the frame of view to get the softest light. I prefer using a bounce or reflective umbrella when shooting groups because I can have the umbrella further away and it spreads the light broader. Hi Will and thanks for letting us ask you qusetions here. New first meeting was last night enjoyed it. "I am tring to learn as much as i can about outside off camera flash. My questions is first is what equitment do you use. What is your starting set up for outdoor small flash if you do have a starting point. Say when you are on location and you have your camera settings at ss 400 f/4 iso 400 the 580exll and do you use FEC and CEC to off set say CEC@-2/3 and FEC@+2/3 and what kind of defuser do you use. I use a Canon 1D Mark III and 5D Mark II for camera bodies and various lenses. I have four 580EXIIs and three 430EXIIs for speedlights. I also have Alien Bees and White Lightning studio strobes. I use various modifiers for both my speedlights and studio strobes. To answer your second question.......there is really no cookie cutter settings for lighting or exposure for that matter. The settings will or should be determined by how much light is available and what effect you're trying to achieve. Get to the location and then start metering for the ambient light. Each location will call for different settings. Also, you should try to stay within the max synch speed of your camera to flash. In most cases, that will be between 1/160 - 1/250 shutter speed...unless you're using high speed synch. That's a whole another discussion. I shoot in manual mode for the camera and flash so there is no reason for me to use FEC or EV+-. I get my ambient exposure right with my camera and then set my flash exposure. I may have to make minor adjustments as the ambient light increases or deceases but I find using manual functions renders more consistent results and it puts the decision making in your hands and not the camera's. I use various modifiers and diffusers. The most common is the shoot through umbrella, softbox, and beauty dish. I sometimes have to go bare bulb with just a dome diffuser if it's extremely windy. I had a shoot this morning and it was extremely windy and my umbrella actually turned inside out due to the strong gusts so I had to put it back in the bag. Will if I am using CTO 1/4 gel and I double it, is my output the same as 1/2 CTO??? That's right Frank. Doubling a 1/4 CTO will get you the same color temperature as a 1/2 CTO however, you may loose a bit of flash power because the the extra sheet of CTO may eat some light. It's probably a negligible amount though considering the CTO gels are actually really thin. Well, I hope this has been helpful. If anyone has any follow up questions, please feel free to ask. My next blog article will be on Location Lighting. Here's your chance to ask questions. I'll post as many questions and try to answer them all. Post your questions here regarding exposure, camera settings, light settings/output, color balance, exposure balance, synch, triggering, equipment, etc. Ask away! This was taken with a single AlienBee B800 inside of a beauty dish. This image was made with a 5D Mark II. Alien Bee B800 inside of a large softbox above and to camera left. A reflector below her which counts as another light source. An Alien Bee B800 right behind her. The sun is a huge ball of fire that's a 100 times larger than the Earth so trying to overpower it is no easy task but if achieved can render some dramatic results. Three 580EXIIs firing through a shoot through umbrella camera left, manual. All full power, all with a 3/4 CTO. All three were connected to a single PocketWizard PlusII. Most DSLRs these days have a maximum synch speed with the flash at 1/160 to 1/250. The shutter speed can be faster than the maximum synch speed but the flash will not fill the entire frame. This is problem when shooting in a studio where there's very little ambient light, but not that big of a problem when shooting outdoors where there's plenty of ambient light. 3 Canon 580EXIIs firing through a shoot through umbrella all at full power camera left. I cheated the native sync speed 0f the 1D Mark III which is 1/250.